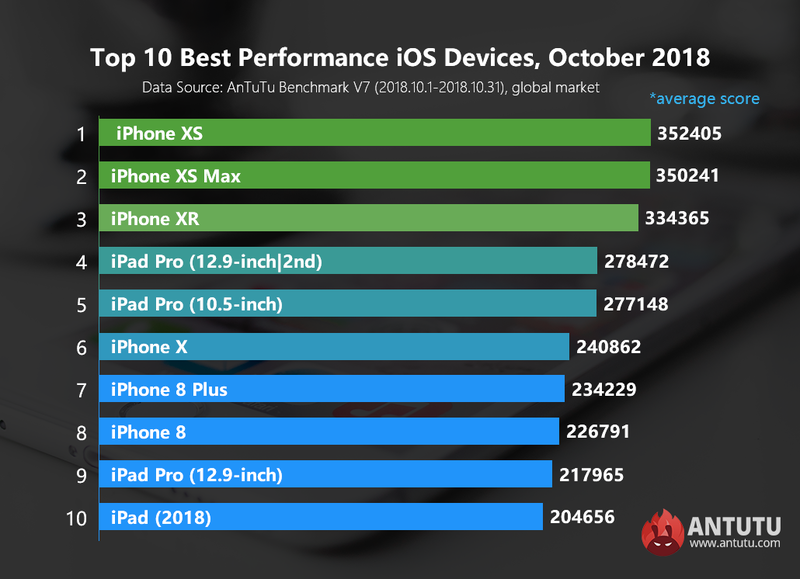 Today it’s time for Antutu to reveal our most updated benchmark results for the 10 best performing iOS devices for October 2018. What are the best iOS devices on the market right now? Check out our most updated top 10 ranking list as measured by the average Antutu score. 2. Period of data collection: August 1, 2018 to August 31, 2018. With iPhone XR going on sale, the new generation of iPhone siblings powered by Apple A12 Bionic processor finally appear on the top 10 iOS list together, and unsurprisingly sweep the top three positions, with iPhone XS, iPhone XS Max and iPhone XR ranking first, second and third respectively. In particular, both iPhone XS and iPhone XS Max get an average Antutu score of over 350,000 points, which should be normal performance of A12 processor. In contrast, the performance of iPhone XR seems a little abnormal, with an obviously lower average Antutu score of only 334,365 points. We speculate that the abnormal performance of iPhone XR may be due to insufficient data sample of iPhone XR in Antutu database. In addition, the issue that caused Antutu Benchmark to crash on iPhone XR at its launch may be another factor for the lower score. In November, as the number of iPhone XR scores reported to Antutu database increase, the average score of it is expected to increase. Making up the rest of this month's top 10 are the 12.9-inch iPad Pro (2nd generation), 10.5-inch iPad Pro, iPhone X, iPhone 8 Plus, iPhone 8, 12.9-inch iPad Pro (1st generation) and 2018 iPad. In general, with the launch of iPhone XS series, the iPhone 7 series powered by A10 processor fell out of the top 10 list. Hopefully, the new generation of iPad will lead the pack of the top 10 list in November. By then, the devices making the top 10 iOS list are expected to at least be equipped with A11 processor. The above data reflects the changes of the performance of iOS devices for October 2018. For more information about the ranking list, please visit Antutu official website or download AnTuTu Benchmark and check in the menu of “Ranking”.